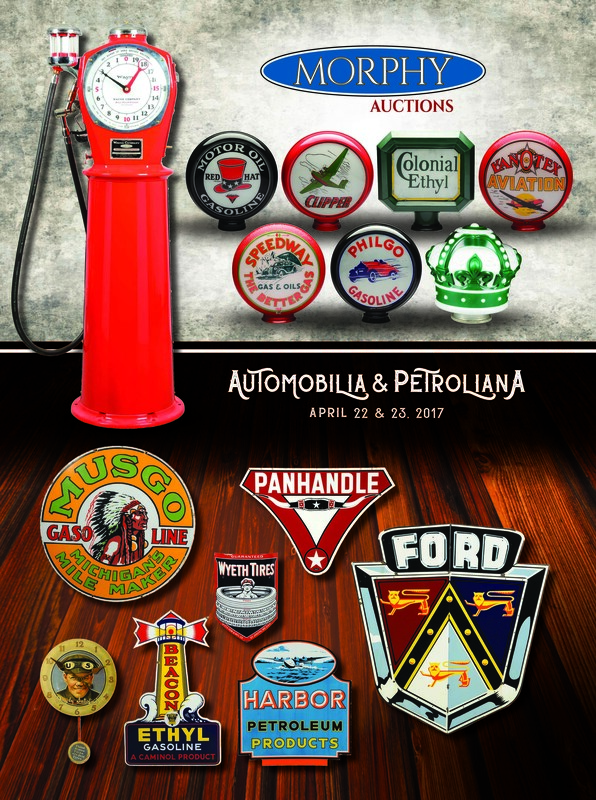 Morphy Auctions’ April 2017 Premier Automobilia and Petroliana Sales Event to Include a Full Spectrum of World-Class Signage, Globes, Pumps, and Oil Cans. This highly anticipated two-day auction goes into fifth gear with the most desirable, rare, and interesting category selections in memory. Morphy Auctions, the finest auction destination for fresh to the market collections, is excited announce this 1,000+ lot event to be held on April 22nd and 23rd, 2017. All merchandise from this sale is on display in Morphy’s Pennsylvania auction gallery and available for preview now. It’s can-do with this sale’s amazing selection of about 50 antique oil and lubricant cans. Lot #3, a one quart Polly Penn motor oil can featuring the company’s famous parrot logo is estimated at $2,000-4,000. This round, full, all original example has excellent color and shine. Lot #10, a one gallon French Auto Oil metal can illustrated with the company’s race scene logo hits the road with its $2,000-4,000 estimate. It is unopened with its original lid and screw-on spout; according to our experts, “If you collect one gallon cans, cans with cars or Automobilia, this is one you have to have.” And one lucky collector will strike it rich with lot #27, a Marathon Motor Oil one gallon oil derrick can. This rare example is estimated at $1,000-3,000. Now let’s focus on globes and lenses, two world-class categories in this auction. Over 80 fine lots are on offer, representing a full range local, regional, and national brands. Lot #334, an all-original Standard Oil of Indiana green crown OPC globe in excellent condition, deserves the royal treatment. It is estimated at $2,000-4,000. It’s hats off to lot #414, a pair of Red Hat Motor Oil Gasoline 15″ globe lenses in an original metal body. This very nice example has minimal wear and is estimated at $8,000-12,000. And the pedal hits the metal with lot #803, a Philgo Gasoline single globe lens decorated with the image of a speeding red and blue automobile. This very rare example, in an original metal body, is in excellent condition and is estimated at $10,000-15,000. It’s easy to get pumped up over this auction’s amazing selection of over 100 vintage and antique pumps. Lot #53, a restored Wayne Boyle-Dayton Model #1950 clockface gas pump, is second to none. This extremely rare and valuable pump comes with its spinner gauge, black hose, and chrome nozzle and is estimated at $20,000-40,000. Lot #130, an important and seldom seen Wayne Model #391 “Roman Column” ten gallon visible gas pump has been professionally restored in Sinclair colors and has a reproduction globe. It is estimated at $15,000-30,000. And lot #134, a professionally restored Erie Model #53 Cash Recorder clockface gas pump comes with its white hose and brass nozzle. This rare and desirable example is right on the money with its $15,000-30,000 estimate. Things are twice as nice with the amazing selection of double sided porcelain signs offered in this sale. Lot #67, an unusual, double sided Harbor Petroleum Products sign features a great graphic of Howard Hughes’ Spruce Goose flying out of Los Angeles Harbor. According to our experts, this die-cut rarity is “one of the best examples of this sign known” and is estimated at $50,000-80,000. Another headliner in this category is lot #105, a Musgo Gasoline Michigan’s Mile Maker sign decorated with the profile of a proud Indian Chief. Considered the “holy grail” of porcelain gasoline advertising, this sign is free of any touch up, clear coat, or restoration and is one of the better examples of the septic tank Musgo signs. It is estimated at $80,000-120,000. And a Houston Gasoline sign in a metal hanging ring with good gloss and color is estimated at $15,000-30,000. This fine example is decorated with the company’s handsome green and black soldier on horseback logo. This auction also offers a one-of-a-kind selection of singled sided porcelain signs. Lot #65, a Kelly Tires “Lotta Miles” graphic sign will unquestionably generate a-lotta interest. This example is in excellent condition with perfect color and gloss and is marked “Reliance Adv Co. Milwaukee.” This nearly flawless sign is estimated at $50,000-80,000. Now let’s shine a light on lot #629, a Beacon Ethyl Gasoline lighthouse sign. The Beacon Lighthouse is an icon of early gasoline advertising and this piece is a fantastic example with outstanding color and gloss throughout. It is estimated at $50,000-80,000. And lastly, let’s celebrate lot #185, a Ford Jubilee porcelain rolled edge sign. This extremely rare sign comes in two halves that are bolted together in the middle. It has excellent gloss and color and is estimated at $10,000-20,000. This is the first example of its type that Morphy’s has had the pleasure of offering. This comprehensive automobilia and petroliana auction rounds out with a nice selection of transportation related displays, awards, artwork, and ephemera. Lot #980. A rare US Tires “Tire-ly Satisfied” pendulum clock, is a timeless treasure and is estimated at $10,000-20,000. And the heat is on lot #990, an Approved Red Hat Motor Oil porcelain face thermometer. This hard to find piece has excellent gloss and color and is estimated at $8,000-12,000.